This Snow White and the Seven Dwarfs is very much a pantomime of two halves. The first half is overlong with too many tired gags and references that pass the kids by, plus some high energy song and dance routines that just seem to be there to pad it out – but it is totally redeemed by a rollicking second half. Director Chris Pizzey is very much in the driving seat on stage as jester Muddles, and there’s no faulting his energy and rapport with the audience. Sporting a quick-changing range of increasingly extravagant costumes as Nurse Dolly, panto veteran Jamie Steen is also no slouch at working an audience. 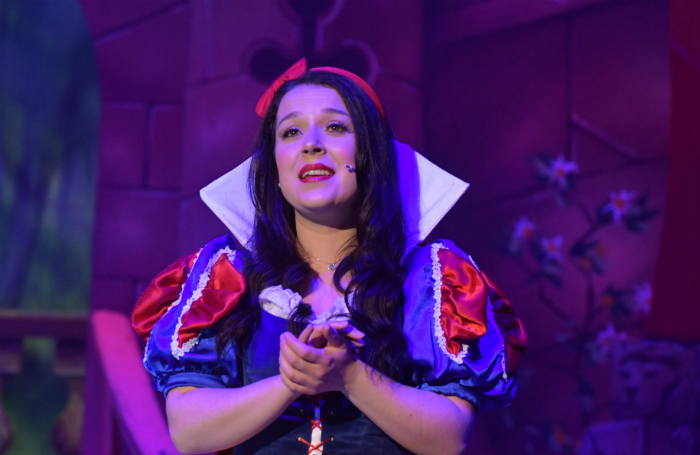 Kirsty Sparks milks the venom from her Wicked Queen, soaking up the booing, but Dani Harmer’s diminutive Snow White has little to do beyond gamely running through the Disney songbook from the 1937 film. It takes a riotous, water-soaked Twelve Days of Christmas to get this show truly on the road. Working alongside Pizzey and Steen, it gives Chris Warner Drake (the Prince) and Kieran Dumont (chief dwarf Pop) a chance to show off their comic potential. A slick, very funny Ghostbusters routine follows and the whole thing rounds off with an Old MacDonald’s songsheet, featuring the usual quota of farmyard animals plus Baby Shark. A pity it couldn’t have been like that all the way through, but it ends on a high.